8 hours in Paris... an adventure en vitesse! When you think of being on tour, you probably think of spending days in beautiful cities around the world. This can be true, but generally, you're lucky if you get a very quick few hours en route to another place. Don't get me wrong, it's still more than most people get in their lifetime, but it makes it tough to really see places. You either have to plan your day down to the minute, or just wander aimlessly and enjoy your environment. I'm normally a trip planner, but we decided to do the latter this time. Paris is one of our absolute favorite places in the world. It's where we honeymooned; it's where I first traveled internationally as a 13-year-old girl that sparked my wanderlust; it's where we are always hoping to stop through when we are touring in Europe. Fortunately, on our way between festival shows in Dinkelsbuhl, Germany and St. Nolff (in the Bretagne region on the Western coast of France), Paris was a logical place to take a quick rest and have a bite to eat. We love to hit museums and cultural spots, but when you have less than half a day to enjoy a city, museums and busy tourist spots can be impossible, especially on a weekend. As you will see on every trip site for Paris, it would take you 100 days to see everything in the Louvre if you looked at every piece for only 30 seconds for 8-hours-a-day! And who wants to be rushed. So we arrived in Paris around noon, hopped off the tour bus at a centrally located hotel, freshened up, and put on our walking shoes. If you have less than a day, I recommend focusing on a few neighborhoods you know you want to wander in. Paris is incredibly spread out into "arrondissements", each with their own character. Our favorite area to wander is Le Marais. 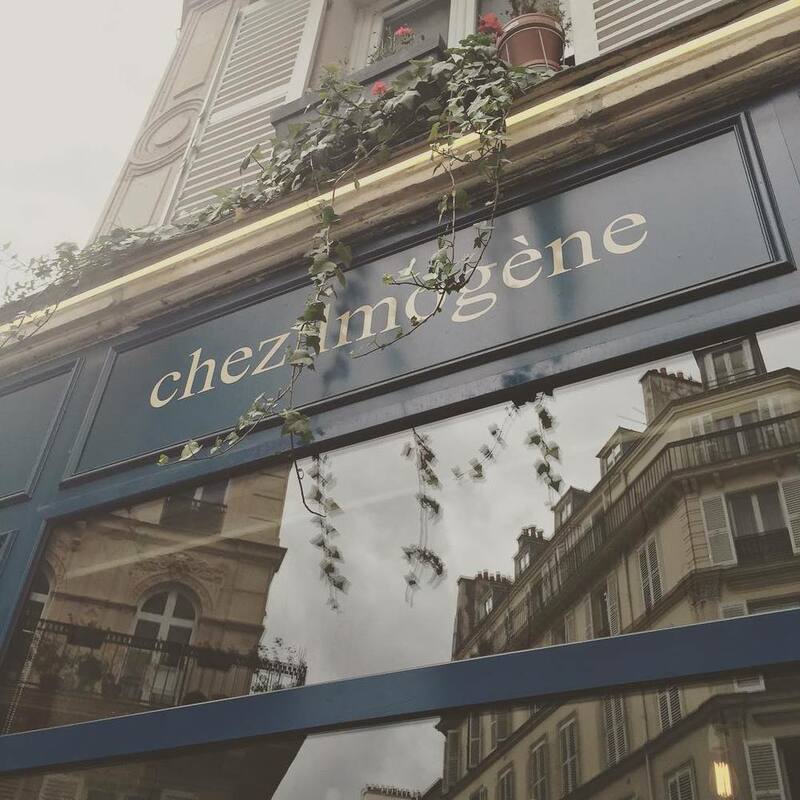 Galettes were first on our priority list, so we hit the charming, quaint, and perfectly Parisian Chez Imogene for both savory and sweet crepes, some midday wine, and espresso. All filled up, we then proceeded to walk 9 miles, yes, NINE, around the 10th, 3rd, 11th, and 5th arrondissements. We didn't have many stops in mind, just the joy of a Parisian stroll. Paris is covered in graffiti and street art. It's pretty much forbidden in our hometown of Orlando, Florida, so when we see expressively covered walls, we love to take a moment to take it in. It isn't the Louvre, but it has its place just as the Mona Lisa does. Paolo, Matthew, and I are coffee junkies, so off to Ten Belles we went for another round of caffeine to fuel our walk. Ten Belles is tiny and charming with a beautifully appointed interior. As a designer and a dabbler in the lettering arts, a solid chalkboard menu just gets my heart going. It was packed to the brim, so we didn't stay, but we got our iced coffee to go (iced coffee seems difficult to find in Europe!) We then spent some time browsing in the Artazart Bookstore, an incredible spot filled with every kind of creative book and knick knack imaginable. I was definitely in my happy place. My next stop had to be Mariage Freres. I'm a tea junkie and I love the beautiful packaging and the historical legacy of the 150+ year old tea shop. I bought a few teas for home and for my mother-in-law. While passing through the MF, I spotted my dream bathtub! If anyone sees one of these lying around for less than $4k, give me a holler. We also strolled past this guy. I don't know his story, but he seemed extraordinarily happy, and I loved his wacky steampunk bike. Something I have to note about Paris is the beautiful attention to typography. I took a few snaps of lettering to use as inspiration for some of my lettering practice. The lettering on "la compagnie des perles" is one of my favorite styles. While walking, we passed the Centre Pompidou, one of my top contemporary art museums in the world. We thought about breaking our stroll to hit the museum, but again, the line was about an hour to get inside, and with such a short trip, it wasn't in the cards this time. We then strolled to what turned out to be an incorrect address for a Laduree location. But it wasn't meant to be as it was time to cab back to the hotel to meet up with the rest of our group to grab dinner all together. "Family Dinner" is a tradition we try to keep alive on tour, a moment to get everyone together to eat, relax, and take a tour breather together. We passed the Notre Dame Cathedral on our dinner walk, but the line was much too long to stand in, and many of us had already been inside on other trips. Time is the theme here! When you have very few hours to spend, waiting in a line isn't the way to go. But nevertheless, it's always a beautiful piece of architecture to admire. It was incredibly challenging to find a French restaurant large enough to hold our group of 12, that would have food to please the whole group, and all of this on a Saturday night. Thankfully, we had Parisian friends help us find just the spot and make the reservation for us. The charming Le Petit Chatelet on the left bank. Dinner was incredible. A bottle (or two) of Chateauneuf-du-Pape, escargot, and Steak au Poivre. Classically French, and always perfect if you had to choose just one dinner in Paris. Sadly, the night was coming to an end. But on our walk back to the hotel, we ran into two Trivium fans (on different streets!) who managed to spot the guys which is always humbling and a great reminder of why we are on these fantastic trips to begin with. A rare night on tour where we actually sleep in a hotel and not on a tour bus, we headed back to our rooms for a good night of sleep before waking up early to hit the final festival show before heading home. San Francisco is so jammed packed with an endless array of sensational restaurants, it's easy to get overwhelmed by options and end up revisiting your old reliables time and time again. We made an effort on this trip to try out newer restaurants, not only to us, but to San Franciscans as well. Once you've been to a city more than a few times, it's time to start experiencing the city like a local, and that means trying new hot spots. We found the charming Marlowe on a few blogs and sites (Eater SF rarely fails us). We never went to their previous, smaller location, but word is that the menu is more extensive in this new location with a full liquor bar. As usual on our trips, we had already stuffed ourselves with breakfast, so by mid-afternoon (and a very long walking effort to work up a hunger) we made our way to Marlowe and shared a few dishes. Although cramped seating, the interior design is on point! It feels French cafe meets American farmhouse, with a bright, light vibe and wall to wall subway tiling complete with a taxidermied bull (is that a bull? I'm not quite up on my grazing animals). We started with the di Stefano Burrata. Burrata is a newer obsession of ours. If you're not familiar, it is a creamy mozzarella and cream blend with a beautifully soft texture. Mixed with bitter greens and savory sourdough, it's unbelievably simple, balanced, and satisfying. Marlowe's burrata dish included grilled pears, crunchy hazelnuts, and an oregano vinaigrette on sourdough. San Francisco sourdough cannot be topped! On vacation, afternoon cocktails are a must. Matt had the smoky La Cuchilla - a nice blend of tequila, mezcal, grapefruit, and maraschino. I had a prosecco special. Marlowe's cocktail menu is extensive and diverse. Something for everyone! If there's a burger at a New American joint, we almost always have to order it. A perfect burger is often a reflection of an entire menu for us. Maybe it's because we both grew up on cheeseburgers, an American family staple (at least in the 80s and 90s). Marlowe's burger, topped with a mild horseradish aioli and caramelized onions, did not disappoint. I'm guessing their fries are housemade as they are dubbed "Marlowe Fries" and they tasted incredibly fresh. They have a sister restaurant (Marlowe Burger) that we definitely want to try next time. Overall, a solid lunch spot with a vibrant menu. Next time we come here, we will try the Deviled Egg Sandwich, some hindsight regrets missing out on that! We started off our last full day in Osaka at a cat cafe. Animal cafe's in Japan are amusing to Americans because it's an odd concept to pay to hang out with domesticated animal breeds that most of us have at home. In large cities on the tiny island of Japan, the ability to have a pet is more of rarity. Tokyo is currently the most populous metropolitan area in the world, so I imagine every square foot of home space is valuable. Matthew is allergic to cats and I've never been fond of cats (and quite honestly, I had never even touched a cat until a few years ago) -- let's just say we are dog people. That being said, over the past few years, I've taken more of a liking to these cute creatures, especially the cat of our travel mate and Matthew's bandmate, Paolo. Paolo is a cat whisperer of sorts so we all agreed this was definitely on the to-do bucket list for our trip. I mostly watched on the sidelines and drank my matcha tea latte that came with our entry fee (only $10 per hour) while locals giggled and took endless photos of the cats. Definitely a unique experience. We then grabbed some amazing ramen at Ramen Zundoya in Shinsaibashi. One of our Osakan friends had just spent a full year eating ramen nearly every single day in Osaka to find the very best, so we trusted his judgment. At Zundoya, you can actually choose how fatty you want your broth! We went with regular fatty, which already seemed like a decadent choice. The broth was rich, almost thick, and incredibly flavorful. Definitely on our Osaka list for all future visits. With bellies full, we bundled up on this cool winter day and headed to Osaka Castle for some scenic walking, fall leaves, and a little culture. Along the way, we had the opportunity to rent samurai outfits to walk around in, but we declined and experienced it by laughing at others. This guy was thoroughly enjoying himself. Onto the castle! Crazy enough, we didn't feel like going in. We just wanted to see the exterior architecture in all its glory. I'm a little wild for gilded gold trimmings. A family photo op to document the trip. We then headed back to catch the Mr. Big show! Don't know who Mr. Big is? Don't worry, I only know the huge monster ballad To Be With You. < Click on it! You know you want to soundtrack the rest of this post with all of that early 90s glory. Being "huge in Japan" is definitely a real thing. Many bands experience years, even decades, of major success in this tiny region of the world well after the US has forgotten. After the show, we headed to Rock Rock Bar and were treated to some authentic home cooking with my favorite dish, sukiyaki, a sweet and salty stew prepared tableside in a hot pot with thinly shaved beef (we were treated to kobe beef!) and vegetables. Our chef was Seiji, the owner of Rock Rock, prepared an amazing meal and we stuffed ourselves beyond capacity. We were exhausted and said our goodbyes to our good friends who showed us an amazing time. Matthew and Paolo updated their very old polaroid on Rock Rock's wall of fame and we were on our way to rest up for our travels to Tokyo the next day. The next morning we caught the shinkansen (bullet train) to Tokyo. If the US had enough sense to create high speed trains across the country, there would be an amazing ability for the average American to travel economically and efficiently. Riding the shinkansen is definitely part of an authentic Japanese travel experience. Paolo waiting on the platform. Passing Mt. Fuji is always a beautiful sight. Here's a crummy iphone video in real time speed! Words can't describe the amount of food we indulged in in a short week in Tokyo and Osaka. We primarily travel to eat, then fit in anything else there is time for, which is why we decided to spend some time in Osaka before heading to Tokyo for Knot Fest. Osaka is arguably the food capital of Japan. Udon, Okonomiyaki, Takoyaki... Osaka specialties, to name a few. After an extremely long travel day (20+ hours! ), we naturally wanted to hit the sheets and sleep, but we just couldn't ignore the flashing lights in Shinsaibashi, vendors turning takoyaki balls by the hundreds, comically large crab and octopus sculptures, and the iconic Glico man; Shinsaibashi is Osaka's own Times Square. We stayed at the Cross Hotel which I highly recommend. It's newly renovated (which is an unusual amenity in Japan for some reason), the lobby flows right onto the main stretch of Shinsaibashi, and was pretty affordable. Their in-room soaking tub was to die for! Our good friend Tomoko kindly scooped us up before our heavy eyelids took over and helped us seek out Okonomiyaki and Yakisoba for our first feast. Okonomiyaki is a savory pancake of sorts. It literally translates to "cook or grill whatever you like." We ended up at Sanpei at Hozenji Yokocho. It was tiny, cozy, and absolutely delicious. We order yakisoba to start followed by three okonomiyaki. We didn't write down what we ordered and we were in a travel fog, but I know our favorite was kimchi and pork. In true Matthew form, he just couldn't go to bed without stuffing himself to the brim. So we stopped at a gyoza shop for him to top off. The next morning I knew the first thing I wanted to hit was another Osaka specialty, and my favorite noodle, Udon. I have to admit that it's incredibly challenging to get around Japanese cities via google maps. Addresses are impossible to spot and often times, you have to be looking up! We wandered aimlessly within 1 block of Kawafuku until we finally realized we had walked passed it a few times. We entered a tiny shop with a few seats at the bar. We slurped our udon with a row of businessmen. We then wandered the streets of Osaka to check out shops. I learned quickly that asking for an American size 10 shoe at Doc Martens was absurd, shops filled with all things American in Americamura are a hot topic in Japan, vintage shops in Osaka have the absolute BEST vintage band shirts, and traveling with two musicians means you will hit any and every guitar shop. Matthew found his guitar and signed a few things for one of the shops. As if 20+ hours of travel and jet lag wasn't enough, I decided to get tattooed at the legendary Chopstick Tattoo within 18 hours of hitting the ground in Osaka. I've had a bit of an unlucky year and also wanted to get a travel token tattoo, so I sought out the incredibly talented Kyon at Chopstick to create a maneki-neko (lucky cat) for me. The story of the maneki-neko originated in Osaka, so I thought it was a perfect fit for my souvenir. You can check out the variety of stories surrounding the meaning. I was a little nervous to get tattooed in a foreign country considering the language barrier, however, Kyon interpreted my emails well and created something absolutely perfect for me with almost no direction! I was also hilariously way too tall for the tattoo table (I'm tall, even for American standards), so I was less comfortable than I'd like to be, but thankfully, it was a quick hour and a half. Seems like a lot to do in one day? Nonsense, we still had a lot of hours to go! Our friend Yoko from the also legendary Rock Rock Bar met up with us to take to a well-known restaurant for a bite to eat before heading to the bar. We stopped at Ajiho in Shinsaibashi and indulged in a few mugs of beer, takoyaki, oden, and yakisoba. Oden is a Japanese winter dish that consists of vegetables, fish cakes, and other items stewed in a savory-sweet soy broth. Even 7-11 in Japan has pots of stewing oden available near the counter for a bowl of super cheap winter soul food. It sort of reminds me of the potatoes and carrots from stewed pot roast, but with a soy-based twist. We then headed over to Rock Rock Bar for a few beers before we called it a night. By 10pm, all three of us could hardly keep our eyes open and were ready to rest up for another day of feasting and adventures. We've been to Japan quite a few times now, and it has generally been challenging to find really good espresso. We are usually relegated to Starbucks (which isn't a bad thing when they have interesting Japanese seasonal flavors to try!) but when you have small batch, specialty espresso, you quickly realize the difference. I found a few blogs where people have discovered the burgeoning coffee culture in Tokyo, and we were quick to add a few spots to our list. When I heard about this unbelievable, has-to-be-seen latte art, we hustled on over to Streamer Coffee Company. They have 3 locations in Tokyo. After sauntering through some side roads of Shibuya, we found Streamer Coffee Company tucked away on a quiet backstreet. They had a strict no photo policy near the coffee counter, so I took a few discreet shots once we sat down and refrained from being a nuisance. We ordered a straightforward latte as well as their specialty, Matcha White Chocolate latte - the "Military Latte" due to its camo-like surface after all three ingredients are mixed together. We had reservations on matcha mixed with espresso, but it was positively perfect! Matcha White Chocolate Espresso Latte - "Military Latte"
We also stumbled across The Roastery by Nozy Coffee while walking through Harajuku. At The Roastery, they actually roast their own single origin beans inside the shop - it felt like we were back in San Francisco! I snuck a few photos in despite getting spoken to in Japanese in what felt like a request to not photograph. The Japanese culture is quite camera obsessed, so I was surprised that both coffee shops had a similar sentiment, but we of course obliged (got a few in before though!) I think they like to keep their amazing latte art a well-kept secret. Next to The Roastery (although not related) was the cutest little donut cart called COCO-agepan. These donuts were amazing! They were filled with organic refined coconut oil cream. We've never had anything like it and we are eager to try to figure out how to make these ourselves. We love to try new spaces and places, however, we also have our list of never-to-be-missed spots that we continue to repeat every time we visit a city. San Francisco is probably the one city with our most tried and true favorites despite endless new places to experience. Every time we are in San Francisco on a Saturday morning, we try to hit the Ferry Building Farmer's Market. It has grown to become a city and tourist favorite over the years, but hasn't lost any of its charm despite its growth. The building itself is beautiful and at over 100 years old, it was once a transportation hub for the city. We are always interested in spaces that allow you to experience history with a modern utilization. We started our visit with coffee from Blue Bottle Coffee; it was a heat wave this trip so we opted for the New Orleans style iced coffee in lieu of our usual lattes; creamy and lightly sweet, it's the best iced coffee we've had this year. We also always go to Primavera Mexican. We don't have a lot of authentic Mexican food in Orlando, yet it's one of our favorite cuisines. This trip we got the tamales and chilaquiles. Perfection! It wouldn't be a trip to a farmer's market if we didn't bring back some goodies to keep the memories alive at home. This trip, we visited Dandelion Chocolate. We have a little bit of a fancy chocolate bar addiction, so we had to pick up some small batch dark chocolate. Be sure to head to their site and read about their artisan bean-to-bar process. If we lived there, we would definitely sign up for a class! We also picked up some lavender sugar, but we basically love all things lavender. A shortbread recipe is definitely to come. We also rarely miss a trip to the Miette shop because eating macarons is something that is best done as much as humanly possible. Perfect "feet" and impeccable flavors. We paced ourselves with just three. We make the trek to San Francisco quite often to get tattooed and overindulge in the bountiful offerings of the City by the Bay. Of our many times here, we haven't ventured to the coast before considering there is so much to do inland. Like most people nowadays, we follow many talented and interesting Californians on Instagram and kept seeing visits to Outerlands pop up in the feed. Enticed by the beautiful photos, Four Barrel coffee with perfect latte foam leaves, and farm fresh ingredients, we made it a point to head out to Ocean Beach on this visit. I checked in advance, and since there are no reservations, we were given the advice to head there early to beat the crowd. We thought 9:30am for San Franciscans was pretty early, but everyone else seemed to have the same idea. We only had to wait 30 minutes, and the weather was cool - it was well worth the wait. It was a different experience being seaside - 15 degrees cooler than inland, lots of barefoot surfers waiting in line for coffee, and the laid-back vibe of the locals. We definitely recommend Outerlands as a must-visit, and we'll certainly be back. When you're on a trip for two, it's tough to get photos together, so we try to at least photo across the table when we can remember. We sat outside, as the wait was much less, but peeked inside to see the beautiful interior covered with wooden planks and a rustic vibe. When I think back in the years, I don’t ever recall being a huge American breakfast fan. Since I always had the option of Japanese breakfast growing up, I don’t think I appreciated the greatness that is the American breakfast. Lately, Paolo and I’s thing has been nabbing up as much amazing breakfast in the USA as possible. America does several things very well in food, and breakfast (now that I am of the converted) in America is pretty damn amazing sometimes. When it comes to narrowing specifics, anything in the range of the diner realm is something I gravitate towards. Whether it’s a greasy spoon, old school diner; or something like a New American diner doing familiar dishes with impeccably sourced local ingredients, having fun and taking liberties with adding in the unexpected - America has something darn fine going on (Canada does a good diner sometimes too). This best-of-the-best list takes you to the spots I stuffed my face at first thing in the (touring band dudes’) morning (typically 11:45am/noon). 1. Albuquerque, NM. The Grove. This is the cafe that Walter White in Breaking Bad frequented. This is where the Stevia packet was poured. This New American-style diner does modern and classic favorites alike; it has cookbooks and kitchen utensils and such for safe; the orders are done at the counters, and man is everything fantastic here. Paolo and I shared breakfast with Chris and John from Devildriver, I had: coffee, croque madame (toast with ham, cheese, and an egg on top), a side of thick back bacon, and macaroons. I am a sucker for French food, and The Grove nailed it. Best breakfast of the tour in a sacred location of television. 2. Asheville, NC. Early Girl Eatery. Asheville’s Early Girl Eatery has the charm of an old diner, mixed in with being something run by cool local kids. We had lots of the Trivium band and crew in tow here for our feast. The meal included: Local sausage and sweet potato scramble, multigrain pancakes, and fried green tomatoes. The fried green tomatoes here are a show-stopper. 3. Chicago, IL. Little Goat. Little Goat is in my mental notes of the sort of place I would open if I ever owned a restaurant. A modern, sleekly, yet warmly designed spot with the traditional diner as the backbone and inspiration upon what is built up here. Little Goat in Chicago and Skillet in Seattle are my favorite vibes of the “modern” diner as I call ‘em. Chicago is a beast when it comes to having an endless supply of mind-blowing food, and Little Goat follows suit. I went for their corned beef hash and a coffee. It was familiar, but done in that New American way that I love so much in the USA. 4. Minneapolis, MN. Moose And Sadie’s. Moose And Sadie’s like everything previously mentioned has become our tradition every time we hit the city. Moose And Sadie’s is setup like a local coffee shop with a counter you order at which slings out some really delicious stuff. I went for the huevos rancheros and a side of potatoes. Really impeccably done in it’s simplicity and freshness of ingredients. 5. Boise, ID. Goldy’ Breakfast Bistro. Great local diner run by younger folks. Beautifully done diner classics. I went for the omelette with spinach and gruyere, Goldy’s peps potatoes, maple house-made sausage, and wheat toast. 6. Spokane, WA. Frank’s Diner. Of the list, this is the first truly old school diner that is still hanging around sending out fantastically done breakfast and diner classics. I went for the hobo scramble here. I am a big fan of eggs, potatoes, cheese, and a meat all being paired up. As a kid, my dad would always mash all those components up in his breakfast and him and my sister would call it “mush”. It took me a few decade - but now all I want is “mush”. 7. Charlotte, NC. Mattie’s Diner. 8. Boston, MA. Eastern Standard. 9. Thunder Bay, Ontario. Niva’s. 11. Saskatoon, Saskatchewan. The Poached Egg. I had the senator omelette. It was vastly overpriced, the potatoes were sad and obviously from a frozen bag, the eggs were burnt, the waitress very rude to Paolo, Chris (Devildriver), and myself. I don’t normally pick out spots to call out - but we walked far as heck to get there, were treated badly, fed badly, and ripped off as far as I’m concerned. Don’t go there. In our epic conclusion to the trio that is "The Return Of Kiichi-kun III," Ashely and I were finally able to venture into Tokyo and begin our exploration of all things Japan. The first expedition found us wandering the back streets of Shibuya to head towards Harajuku. At first, we felt as if we were completely lost, attempting to utilize my phone maps (which for a USA phone in Japan, it doesn't quite work right). Eventually we found the shops getting cooler, the food stalls becoming far more interesting looking. We popped in and out of punk-clothing shops, a baby clothes store that featured graffiti-style printed clothes for toddlers, some thrift shops, then gradually made our way towards Kiddy Land; the king of all toy stores. I've hit Kiddy Land each time in Japan, collecting my Final Fantasy toys, but this time they had none! We stocked up on omiyage for our friends and family, then went for food. Harajuku Gyozalo was lunch; and man, lemme tell ya, gyoza is one of my favorite things on earth. Meat stored in little packets of carbohydrate-y goodness is always what I have a craving for. Needless to say, this legendary gyoza shack was amazing. Shabuzen was dinner. We reunited with Koji from Roadrunner to sit back and chow down on all things meat. My okasan would always make sukiyaki at home, but I've never tried it in Japan; my goodness was this place good. Shabuzen was Ashley's favorite meal of the whole trip; this restaurant is the spot where Bill Murray and Scarlet J. had their fight in "Lost In Translation." The following day found us traveling as a duo towards Asakusa to wander the shops and eat fresh senbei. A good friend of mine - Ken Sakurada - who owns Shin Sushi in Orlando (sushi as good as Japan basically) told me to meet up with his friend who works at Yoshikami, Azuma-san. Yoshikami for me was one of the truly most unique things I've ever eaten. Yoshikami's food reflects the American soldier's description of the diner in Japan; it's basically the Japanese interpretation of what the American diner is, but utilizing a Japanese spin on it all. Omme-rice and pork cutlets were our lunch, along with some ice cream for desert, and for me it was a wonderfully unique experience. Omme-rice is something my okasan would always make for me for breakfast. After our lunch, we grabbed the train to Ueno park and the Tokyo art museum. It was a Japanese cultural tour that inspired "Shogun," and this time around the limitless sea of inspiration I found within the museum will certainly be seen throughout many musical things I create next in Trivium and Mrityu. Spanning from ancient triptychs that could be new tattoos for me, to busts of ancient demons and goddesses who could be referenced in song, wandering the halls of the art museum in Tokyo was fuel to the creativity that I always long for. Ashley had a step-tracker wrist band that she had on for the day, when we finally got back to our room after our day of sightseeing, it said we logged 10 miles! I Love Meat was our dinner pick for the night: Yaki niku; always a crowd pleaser. We had multiple cuts of beef here, unfortunately we had no Japanese speaking friend with us, so it was a lot of pointing at images of cartoon cows to figure out the cuts of what we were eating. Afterwords, we hit Ishinohana for a Pisco Sour and something fancy I can't recall the name of that Ash guzzled down. Ishonohana was a seriously fancy little joint for cocktails. The waiters were dressed in the prohibition-era style that is so popular in America; these guys sure had their craft down. Watching the bartenders here is watching artists at work. Our final day saw tempura udon for breakfast, followed by a trek into Loft (for cute omiyage), Mandarake (to browse some anime comics), Blitz (for a metal T shirt or two), a panchinko arcade, then some photo booths that turn everyone into giant-eyed anime-girls. Yes - I did this as well. Lunch? More ramen and gyoza!! For dinner, we found ourselves at an all chicken restaurant called Toriyoshi that we had with Koji-san. We had: Kirin, a thick chicken soup, a salad featuring chicken, a thick and rich oden with all parts of the chicken, yaki-tori chicken parts, oyaku-donburi, then even more chicken in the form of tempura. Holy chicken, Batman! It was a delicious final meal with our beloved pal Koji. The morning of our flight, naturally - I wanted ramen again, but Ashley said she was “ramen-ed out”. My favorite breakfast is the Japanese breakfast (rice, salmon, miso soup, and tea), Ashley’s - the French breakfast (croque madame and cafe’ au lait). Lo and behold in all it’s combined splendor, we found the best of both worlds, we found a Japanese/French bakery. We had matcha croissants and scones; crossaints with cheese; a hotdog-stuffed pastry of some sort; and another cheesy roll. Ashley was a very happy Francophile. Unfortunately for us, it was time to fly back home; Ashley was to get back to her job as Creative Director at a local creative agency, and it was time for me to get back on tour again in North America, melting the faces of countless metalheads around the USA and Canada. I’ve said it before, and I’ll say it again: Japan is the greatest place on Earth.